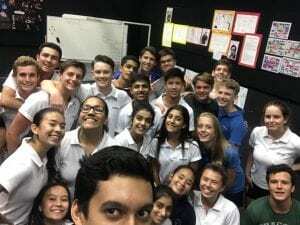 This is my sixth drama production collectively throughout middle school and high school at UWCSEA, which I believe gives me quite a bit of experience in this field. I have thoroughly enjoyed every single aspect of the productions I have worked in before, which is why I am very eager to get started on this one. I believe my strengths lie in helping direct and devise; I love to come up with ideas and find new, creative ways of blocking a scene. I also like to think that I am a good collaborator because of the experience I have in working in groups. I am a leader, I naturally like to guide the group whenever the opportunity comes to me, and I hope to use these skills well throughout this creative process. While I pride myself in being a leader, I am aware that oftentimes, others do not get an opportunity to have a voice in a group and I want to work on allowing everyone to have a turn in sharing their thoughts. I also hope to build my theatrical skills in naturalistic theatre, as the last production I did was very unnatural and fantastical. We have had about 3 weeks of rehearsals thus far and my involvement has given me multiples chances to use the drama skills I have to help block and produce movement sequences. I have been able to open myself up to others and embrace their ideas and strengths, as well as let my own skills and strengths be known in the process. So far, there haven’t been many struggles; I only hope to address any struggles I do face with positivity and a growth mindset.